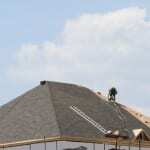 When you need roof repair in the Angus area, rely on our experts at Slippery Slope Roofing. At Slippery Slope Roofing, we are one of the best roofing companies in the Angus, Ontario area, delivering impressive service and high-quality results on every job. In fact, we assign our entire crew to work on a single job until it’s done. Some people are skeptical of roofers, especially if they have had bad experiences with companies that aren’t honest or promise results but don’t get the job done on time. Some roofing companies also charge a fortune for a basic roof repair or replacement service, which can make the idea of having work done on your roof seem out of reach. Unlike other companies, we work with integrity in every step of the work. When we provide you with a free estimate on your roof repair or other roofing service, we’ll take every step of the job into account to ensure that the cost estimate is accurate and fair. In addition to reasonable pricing, we offer the best quality materials and quick, efficient turnaround times to minimize disruption at your home. If we determine that roof repair isn’t the best option, we’ll talk about how to fix your roof in a more comprehensive way, reducing the need for additional costly fixes in the future. Give us a call at Slippery Slope Roofing to schedule a consultation for a free estimate on your roof repair. We’ll be happy to perform a full inspection and make a plan to keep your roof in good shape and able to handle the changing seasons.